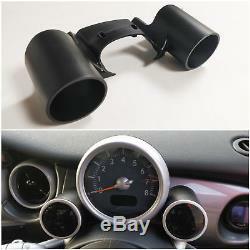 Orranje Rev Counter Gauge Pods 52mm - MINI One Cooper S R50 R52 R53. The Orranje Rev Counter Gauge Pods replaces the shroud behind the rev counter, and adds a pod either side allowing you to house a 52mm gauge in each. These are made from injection moulded black plastic, and are suitable for painting. Installation is as simple as removing two bolts from the existing shroud, disconnecting the rev counter to allow the shroud to be removed, and replacing with the new Orranje Rev Counter Gauge Pods. Please note, gauges are not included. We hate waste, so we have taken the decision to reuse as much packaging as we can to reduce the amount that we throw away. Please don't worry though; we will only reuse packaging if we are confident that it will offer the protection your item requires. For MINI enthusiasts by MINI enthusiasts, bringing you top quality MINI Performance Parts, MINI Tuning & MINI Styling Products. Orranje Performance offer quality and affordable parts, with an aim to help you build your ideal MINI. The item "Orranje Rev Counter Gauge Pods 52mm MINI One Cooper S R50 R52 R53" is in sale since Tuesday, December 11, 2018. This item is in the category "Vehicle Parts & Accessories\Car Tuning & Styling\Interior Styling\Gauges & Dial Kits". The seller is "orranje-performance" and is located in Lichfield. This item can be shipped to North, South, or Latin America, all countries in Europe, all countries in continental Asia, Australia, New Zealand, Egypt, Reunion, South africa.